We’ve entered the thick of the semester and if there’s something we need, it’s comfort food. We’re starting to think that all of our professors actually meet up and schedule weeks like this on purpose- surely three tests at once can’t be a coincidence, right? Plus projects- ain’t nobody got time for that! So we’re hanging out in the apartment working on our respective assignments (specifically Kristen is paper mache-ing a wine bottle and I’m using a Mr. Potato Head to model genetics) and to keep ourselves from throwing our work around we decide to find a quick and easy Pinterest Project. Because what do we do when we’re stressed? Blog, of course! 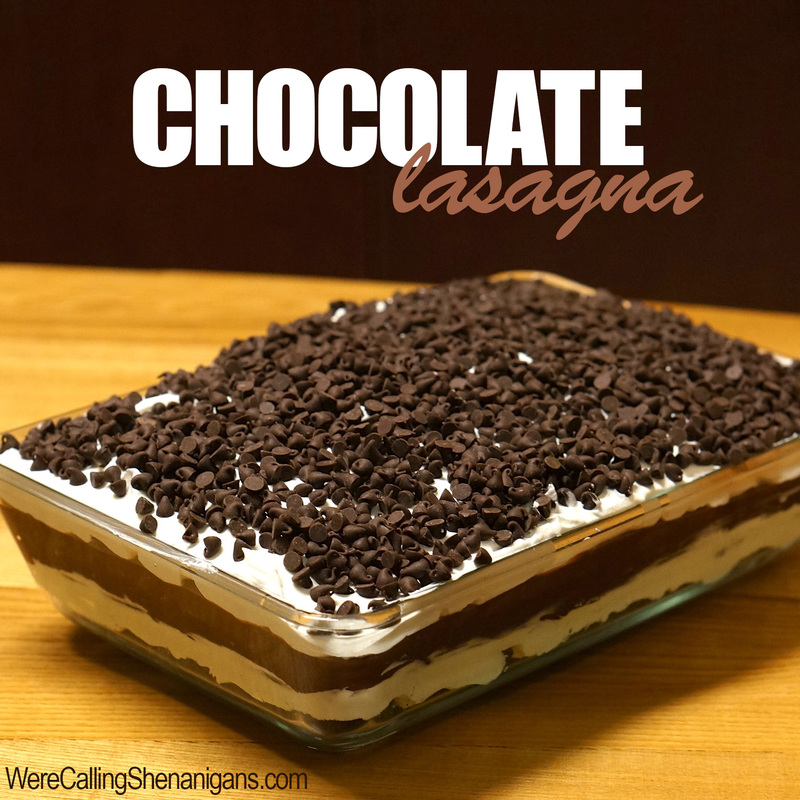 Enter this awesome chocolate lasagna recipe. Although this could probably go without saying, chocolate + lasagna are probably the two best comfort foods known to man. Lasagna makes me think of being home with my mom in the kitchen, wrapped in the warm Italian scent. Plus I find the process of assembling the cheeses and noodles in itself therapeutic. Throw in chocolate and I’m sold. A 2009 study published in the “Journal of Proteome Research,” actually linked consuming chocolate to the reduction of stress hormones in the body! So we get to write this off as medicinal, right? This is just the list of ingredients we used- you could really throw any sort of chocolate ingredients in here and we’re sure it would turn out. Before you start the assembly, you’ll need to make the pudding to the package directions. 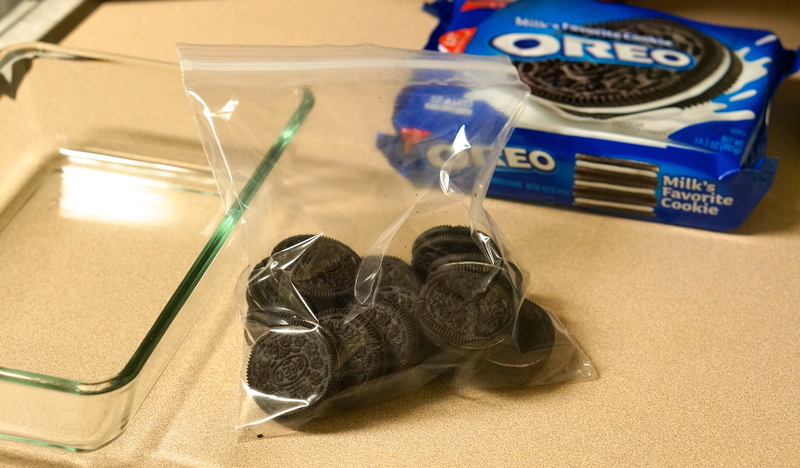 Throw a good number of Oreos into a ziplock bag. If you’re particularly concerned about a mess you may want to double-bag the Oreos. 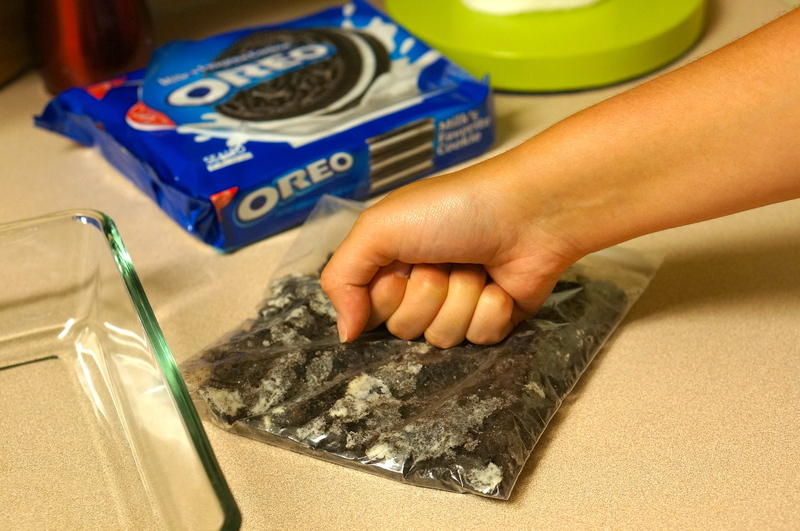 Crush up the Oreos with your hand/a hammer/any other hard object you have lying around (this is the other stress-relieving part of the recipe). 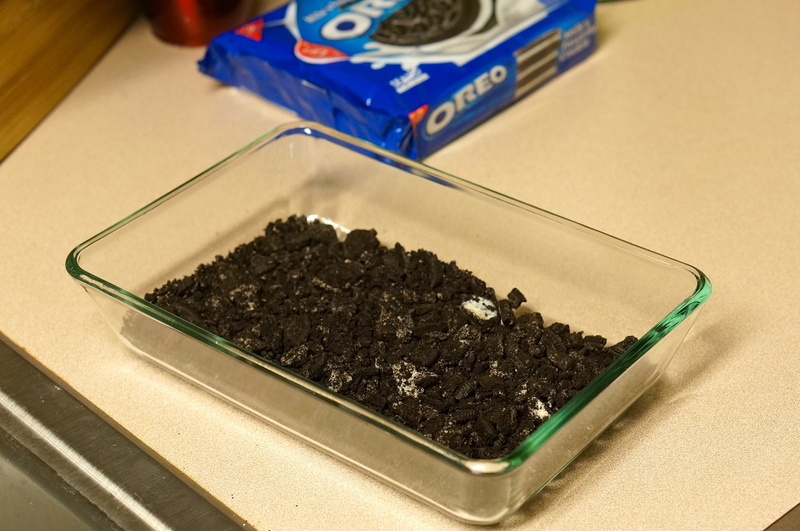 Spread the crushed Oreos on the bottom of a cake pan. 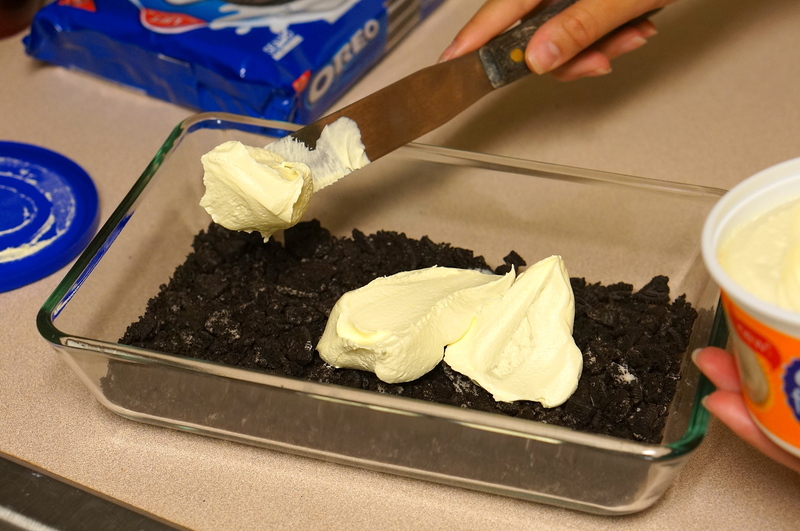 If you want a harder crust, you can drizzle melted butter over the Oreo layer and toast it in a 350 degree oven for a few minutes. This is completely optional- we chose to skip this step. 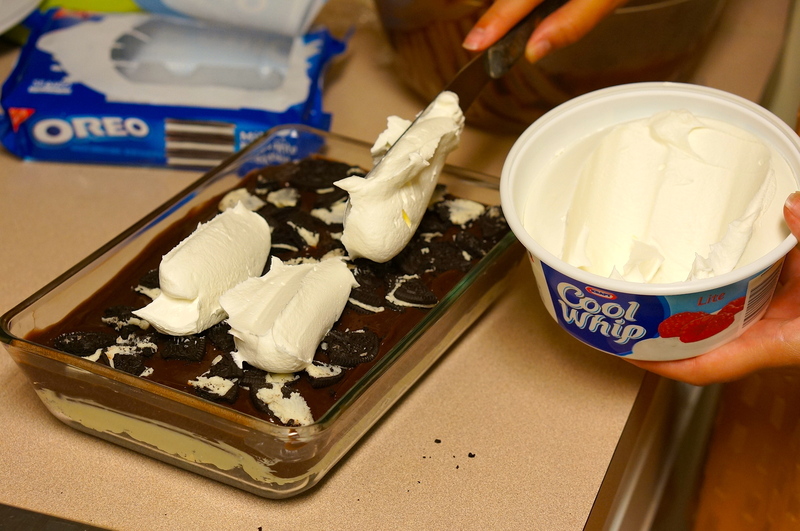 Now you can add whatever chocolate ingredients you want in layers! 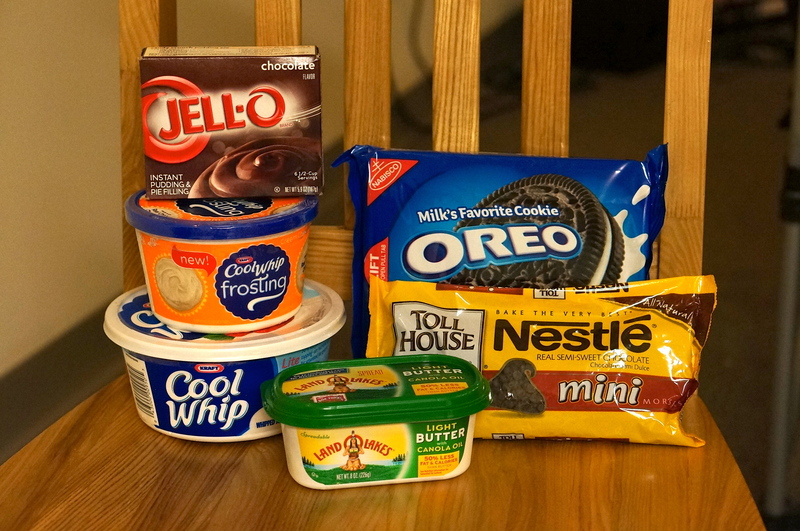 We added the cream cheese icing on top of the Oreos. Spread the layer of icing evenly. 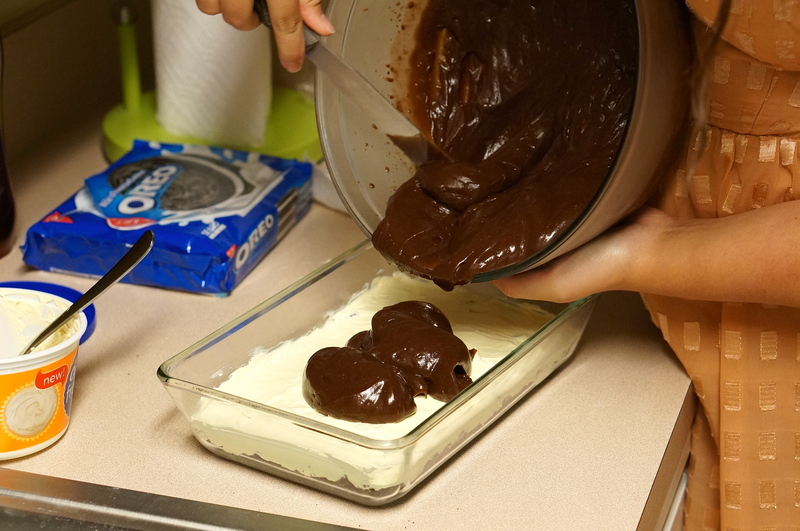 We found it was easiest to do this by dotting the icing all over the Oreo layer and using a spoon to fill in the holes. 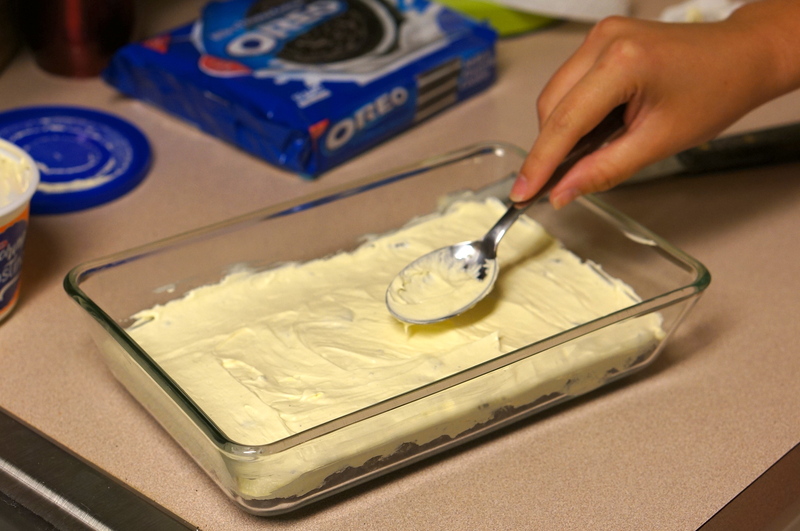 This should be the only troublesome layer (if you’re concerned about your Oreos mixing with the icing, that is). 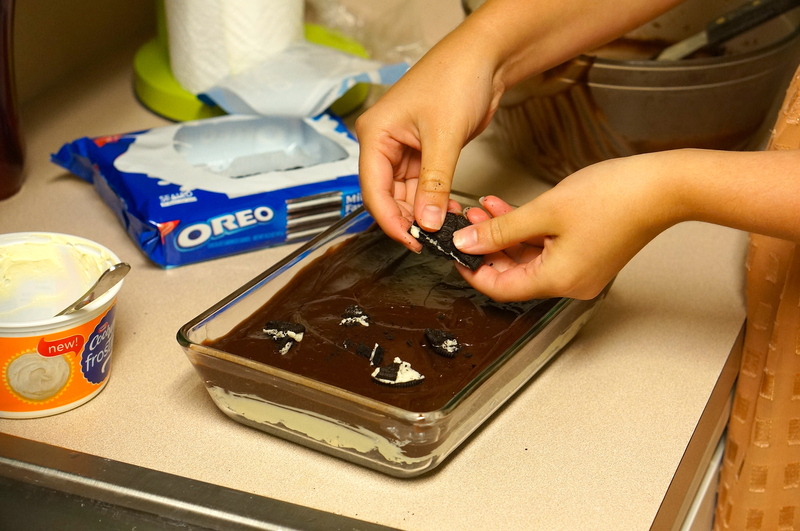 We decided to add another layer of Oreos, because they’re delicious. 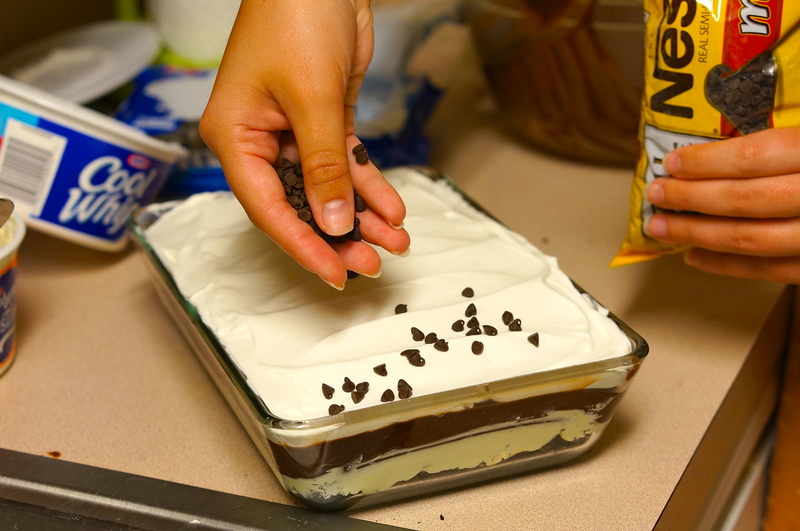 Finally, we topped it off with mini chocolate chips. This shenanigan really served its purpose- it was super easy as well as delicious. We ended up taking it to our friend’s birthday and it was a huge hit! As you can tell, Cameron really enjoyed it! Not including making the pudding (which only takes 5 minutes if you use instant pudding), this shenanigan really only took about 3 or 4 minutes to assemble. Which we think makes it one of our quickest ones yet! Perfect for a stress reliever, since it won’t take you from your work for too long. Feel free to get creative with your layers- let us know what you all try in the comments below! For more shenanigans like us on Facebook! This looks and sounds incredible! Death by sugar, yes, but totally delicious! This a chocolate LOVERS dream come true! Clint would wipe that right out! Awesome looking!!! That is very strange, sorry about that, I don’t see any problems on my end but I will continue looking. If you would like the posts emailed to you, enter your email on the homepage to subscribe, that way you will have all the new recipes that I post. Hope that helps! 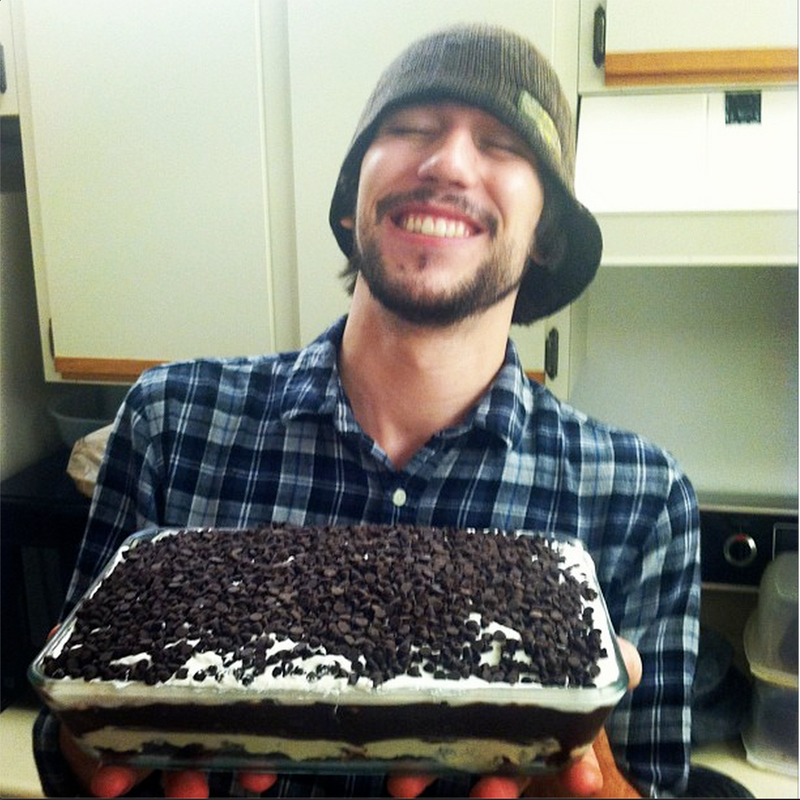 Please send the chocolate lasagna recipe to my email cant wait to try it! The kind of recipe I like. Little work & fabulous results. Next on my list. Please could you email the recipe to me. Want more simple n Delicious recepies…. Please… Waiting…. I’m publishing new recipes all the time, be sure to subscribe above, or follow me on Facebook so you don’t miss out!